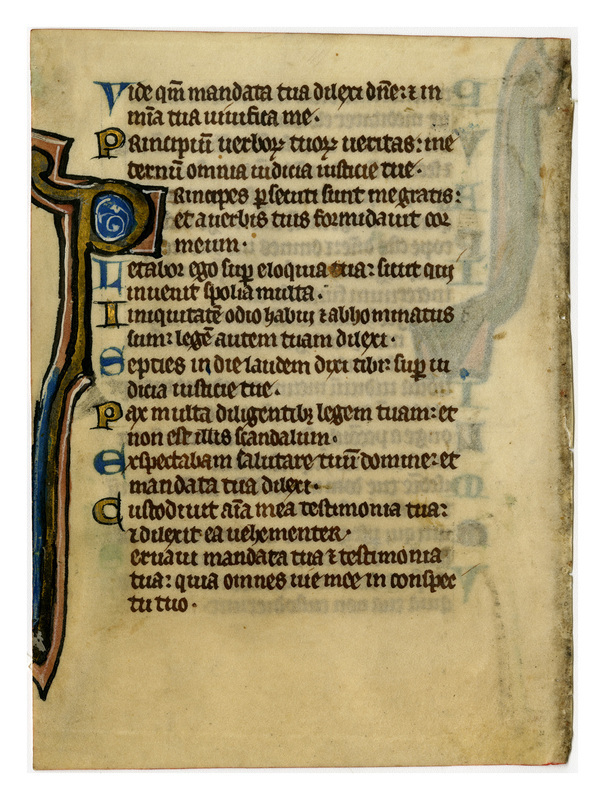 This small Psalter leaf illustrates the fact that, although skilled scribes were available in many monasteries in the 13th century, some of the monks who attempted to apply and burnish the gold leaf were still struggling with many problems of illumination. The famous treatise De arte illuminandi and Cennino Cennini's Trattato were both of later date. These works gave directions on how to prepare and use the glair of egg, Armenian bole, stag-horn glue, and hare's foot, and on how to burnish the gold with a suitable wolf's tooth. These books might not have been too helpful, however, for the author of the De arte illuminandi adds, "Since experience is worth more in all this than written documents, I am not taking any special pains to explain what I mean." The vellum is of poor quality, yellowed, hard, thick, and stiff, and the decoration and illumination are clumsy. The page has been cropped through the illumination on the outer edge. The ink used in the text is brown, with coral, blue, and white for the decoration, as well as gold leaf. Text: Psalms 118:148-158 (recto) and 118:159-168 (verso). 148 My eyes to thee have prevented the morning: that I might meditate on thy words.149 Hear thou my voice, O Lord, according to thy mercy: and quicken me according to thy judgment. 150 They that persecute me have drawn nigh to iniquity; but they are gone far off from thy law. 151 Thou art near, O Lord: and all thy ways are truth. 152 I have known from the beginning concerning thy testimonies: that thou hast founded them for ever. 153 See my humiliation and deliver me: for I have not forgotten thy law. 154 Judge my judgment and redeem me: quicken thou me for thy word's sake. 155 Salvation is far from sinners; because they have not sought thy justifications. 156 Many, O Lord, are thy mercies: quicken me according to thy judgment. 157 Many are they that persecute me, and afflict me; but I have not declined from thy testimonies. 158 I beheld the transgressors, and I pined away; because they kept not thy word. 159 Behold I have loved thy commandments, O Lord; quicken me thou in thy mercy. 160 The beginning of thy words is truth: all the judgments of thy justice are for ever. 161 Princes have persecuted me without cause: and my heart hath been in awe of thy words. 162 I will rejoice at thy words, as one that hath found great spoil. 163 I have hated and abhorred iniquity; but I have loved thy law. 164 Seven times a day I have given praise to thee, for the judgments of thy justice. 165 Much peace have they that love thy law, and to them there is no stumbling block. 166 I looked to thy salvation, O Lord: and I loved thy commandments. 167 My soul hath kept thy testimonies: and hath loved them exceedingly. 168 I have kept thy commandments and thy testimonies: because all my ways are in thy sight. Pax multa diligéntibus legem tuam, et non est illis scándalum. 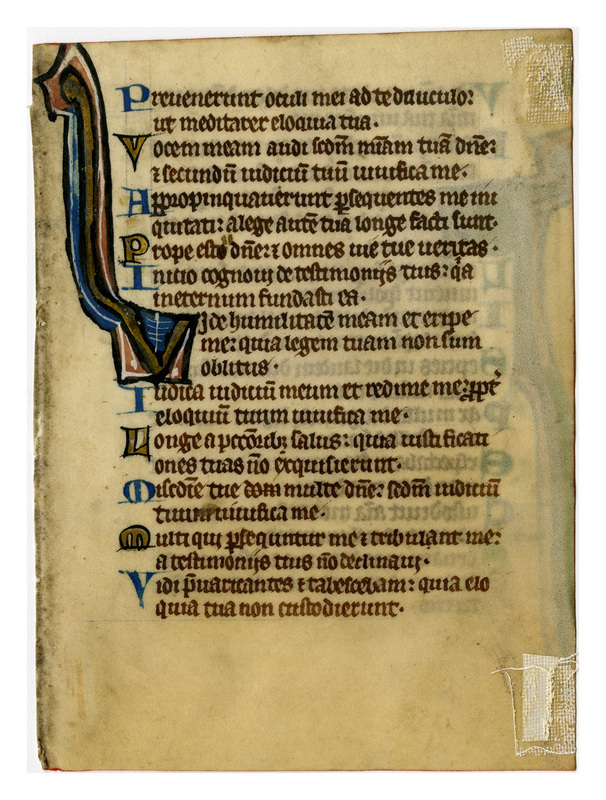 “E0012 Leaf from a Psalter (Psalterium),” Digital Exhibits | Denison University Archives & Special Collections, accessed April 23, 2019, http://exhibits.denisonarchives.org/items/show/36.